This volume brings together--in a revised and expanded format—concepts from the four books in Costa and Kallick’s earlier work Habits of Mind: A Developmental Series. 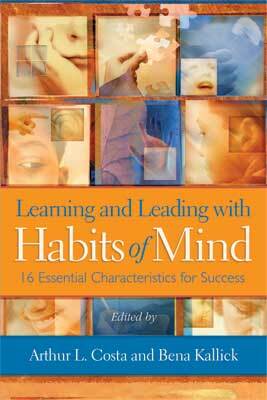 Along with other highly respected scholars and practitioners, the authors explain how the 16 Habits of Mind dovetail with up-to-date concepts of what constitutes intelligence; present instructional strategies for activating the habits and creating a “thought-full” classroom environment; offer assessment and reporting strategies that incorporate the habits; and provide real-life examples of how communities, school districts, building administrators, and teachers can integrate the habits into their school culture. Drawing upon their research and work over many years, in many countries, Costa and Kallick present a compelling rationale for using the Habits of Mind as a foundation for leading, teaching, learning, and living well in a complex world. ARTHUR L. COSTA is emeritus professor of education at California State University, Sacramento, and cofounder of the Institute for Intelligent Behavior in El Dorado Hills, California. He has served as a classroom teacher, a curriculum consultant, an assistant superintendent for instruction, and the director of educational programs for the National Aeronautics and Space Administration. He has made presentations and conducted workshops in all 50 states as well as Mexico, Central and South America, Canada, Australia, New Zealand, Africa, Europe, the Middle East, Asia, and the Islands of the South Pacific. BENA KALLICK is a private consultant providing services to school districts, state departments of education, professional organizations, and public agencies throughout the United States and internationally. Kallick received her doctorate in educational evaluation from Union Graduate School. Her areas of focus include group dynamics, creative and critical thinking, and alternative assessment strategies in the classroom. Her written work includes Literature to Think About (a whole language curriculum published with Weston Woods Studios), Changing Schools into Communities for Thinking, Assessment in the Learning Organization, Assessment Strategies for Self-Directed Learning, Habits of Mind series, Thinking-Based Learning, Using Curriculum Mapping and Assessment to Improve Student Learning, many as collaborative efforts.